LIke many people I love sushi but have had a real mixed bag over the years, from divine to almost crunchy where its been in the fridge too long, but I’ve been inspired by one of the girls at work who showed me how easy it would be to fill my flabulous Black and Blum Bento box with Sushi for a small outlay and very little each day. So last night before I went to bed I took my first steps into Sushi making – and seriously, you cannot believe how easy it is!! But I’m getting ahead of myself here. 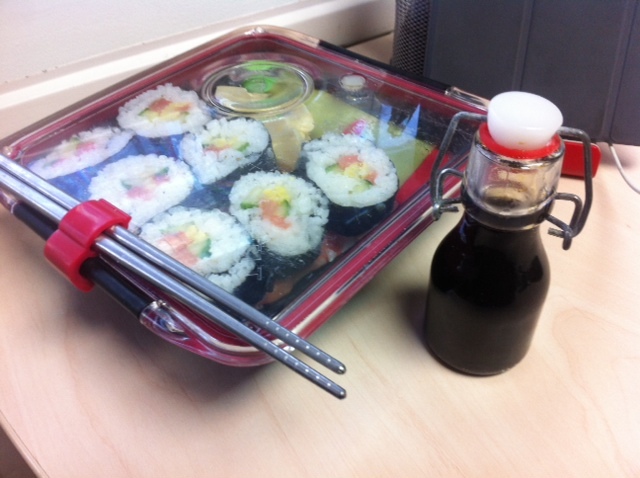 Sushi requires being organised so first of all I assembled my sushi kit…. Then its the extras that make the sushi go further – I had some cucumber and some frozen baby sweetcorn which i defrosted. I then created long slices of cucumber (without the wet centre) and quartered the sweetcorn lengthwise. Youtube proved invaluable when learning how to make sushi. I didnt just want to go with Maki rolls but wanted the fish topped nigiri I love so i learned how to make those as well. Preparation is Key with Sushi. I made up the rice as per the packet using 150g rice and 250ml of water unsalted. I rinsed the rice several times using a sieve and this apparently is the key to avoid over stickiness. then it was simply a case of bringing to the boil and simmering for 10 mins with the lid on. Then I just turned the heat off and left with the lid on to cool overnight. Whilst the rice was simmering I made up the ‘marinade’ that makes it sushi rice – 2 tbs rice vinegar, 1.5 tbs sugar 1/2 tsp salt and then left this in a jam jar overnight too. The next morning I woke up – poured the marinade into the rice and gave it a gentle stir with a chopstick. I then left this whilst I got everything else ready. On a chopping board I assembled the veggies, sliced lengthways pieces of smoked salmon to the length of my rolling matt. I then created small rectangles of both smoked salmon and Tuna for the Nigiri and was ready to assemble. first I tackled the Maki Rolls. I laid out a piece of Nori, rough side up, on the rolling matt and then spread a layer of sushi rice over this, leaving a 1cm lip at the top empty. about a 3rd of the way up I put a line of cucumber, salmon, sweetcorn & then more salmon. Then it was just a case of rolling the mat until the roll was formed, remembering to untuck the matt as I got to the end so it didn’t get trapped. and then sealing with vinegar and rolling will round. Once formed I cut this in half with a sharp knife, then cut each piece in half till I had 8 good size maki. apparently you can buy machines to give you perfect rectangles of rice but Youtube really showed me how easy this was. I wet my hands and then took a small ball of rice and shaped it into the rectangle in my palm. Then it was just a case of laying a piece of fish on the rectangle and using this to finish the shape. 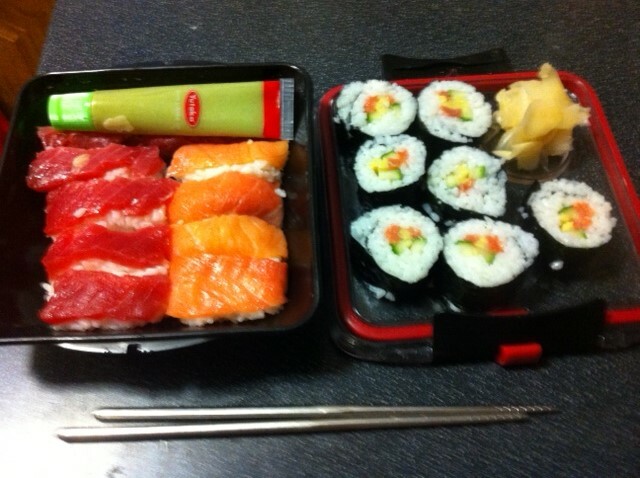 so that was it – a bento box Full of about 16 pieces of sushi in about 5 minutes in the morning. I finished this with a spoonful of ginger in the box and had a bottle of Soy and tube of wasabi to taste. And today was one of the best lunches I have had in a LONG time! !